When it comes enjoying watching TV programs, you need to set the right wall mount for your TV to get the best viewing. You also need to consider the best TV mount (TV mounting brackets) among the types of TV mounts available. 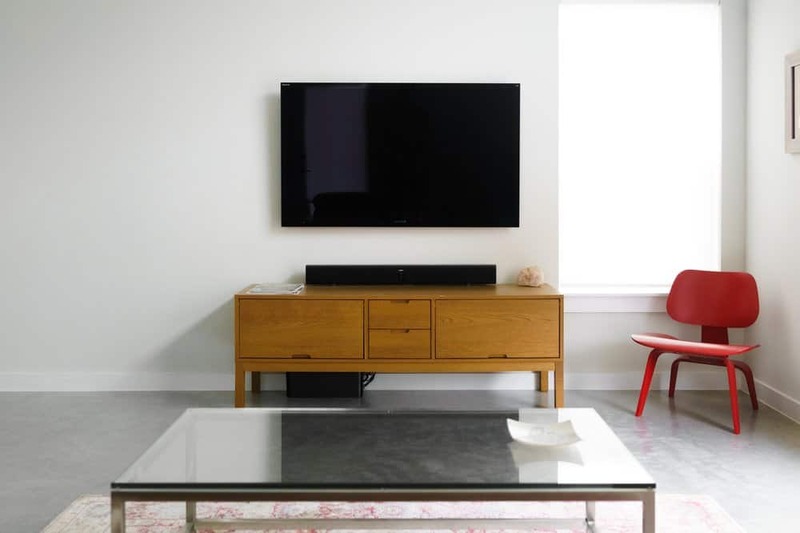 If you plan to buy a TV mount to support your TV, you need to know the details of the features and specification that you need. Read these 12 types of TV mounts before buying it. One of the types of cool and modern TV mount is low profile TV mount. This low profile TV mount is also called a fixed or stationary mount. This TV mount features a rear protrusion. It is designed to put the TV flat against the wall. When TV is placed, It can’t be adjusted once TV is bracketed. You also need to remove the wall bracket and set it back if you want to move the TV into a new place. This bracket also is not compatible with TV flat. This type of bracket is strong and sturdy. Compared to other TV brackets, this type is easy to install. You can even set the brackets in less than an hour. Regarding price, this type has the lowest price among others. Tilting TV mount has similar shape and features. This mount will raise the best viewing when the television is mounted high up on the wall. You can adjust the angle after being mounted and locked in a place. This mount should be mounted between 5 degrees to 15 degrees vertical adjustment. The perfect adjustment will allow you to have a better viewing experience. Are you confused about how putting the ultra-thin TV on the wall? Try to use ultra-thin TV mount. The ultra-thin TV mount is also known as a slim mount. The slim TV mount hangs on closer to the wall compared to other wall mounts. Another type of TV mount is the articulating TV mount. The articulating TV mount is also known as cantilever mount. The TV is mounted on the retractable angle that attaches to the wall bracket. This type is perfect for a wide range of motion. You can pull the TV away from the wall. The TV can be dragged from the left or right. It is also suitable for many rooms with viewing position. Swivel TV mount has similar features the low-profile mount type. This type of mount has less range of motion than the articulating mount with the additional support arm. It can’t be rotated to horizontal movement. Some models of swivel TV mount has tilting capability. There are many TV wall mount types. One of them is ceiling TV mount. As it implies as its name, ceiling TV mount is put on the ceiling rather than a wall. If you want to try something different than usual TV mount, you can try ceiling TV mount. This is a suitable mount for the movie projectors. Another TV mounting options you can choose is platform TV mount. This TV mount is made for the type of older CRT model TV and incompatible to the flat-screen TVs. This CRT model TV will be placed on the shelf where the arms are supported and attached to the wall or ceiling. If you have a small place for placing the TV, you can use under cabinet TV mount. This mount can save the space and is installed and placed under the cabinet. You can use this mount to place the TV in the kitchen or cubicles. This mount is recommended for small screen sizes. If you want to have the widest viewing angles, you can set up a full motion TV wall mount. This type has certain features included when you install it. You can have a swivel, articulating, extending the arm, and full motion integrated into full motion TV wall mount. This mounting bracket is attached to the wall in on one side, and another side with swiveling arms extend outwards. You can minimize and fold the arm so it will appear the TV to look flat against the wall. This bracket also comes with the vertical and horizontal adjustment. This type is perfect for you who want to have the best viewing TV. Since the features are flexible, the price is higher than any other types. It also requires a more complicated setup process. You could try another different option of mounting your TV. You can have a TV mount stand instead. You can place your TV on a tabletop, a mantelpiece, or a shelf. The TV mount stand seems firm than other types of mounts. No need to drill or hassle activities. Some TV mount stands can also be dragged around or stay firmly in the place. You can choose the best flexible TV mount stand you want to. You can have this stand as your bedroom TV mount. If you want to have a premium look of the TV wall mount, you need to set up a curved TV wall mount. You can use this curved flat TV mount because it is compatible for LCD, LED, plasma TVs, and other 42 to 70-inch flat panel displays. This mount type features the smooth-motion and articulating design which enables the TV to tilt, pan, and extend to find the best viewing angle. Don’t worry about your 60-inch LED TV. You can have this curved TV wall mount as your 60-inch TV mount. After all, all types of TV mounts available, TV mount with UL approval seem more convincing and trusted. UL approval means that the TV mount has passed the additional third-party test. TV mount with this approval is guaranteed that each mount type can carry TV weight four times from the amount of weight that is being advertised. So, whatever types of TV mounts you choose, make sure this TV mount get the recognition from UL approval. In conclusion, these 12 types of TV mounts can be your reference before deciding the best option TV mount regarding features and specification that you want.